We're not all that far removed from The Case of the Girl's Missing Legs, but there's already a confounding new image that has Reddit trying to figure out what the hell is going on. 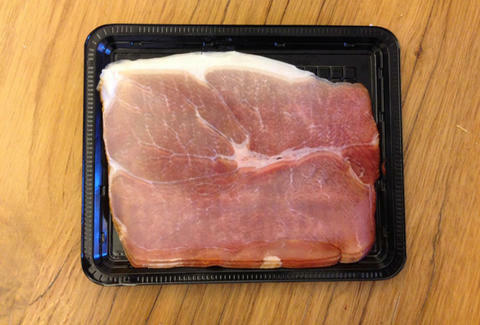 The image in question is a package of sliced ham brought to account for itself by user MelvinDickpictweet on Reddit in a post simply titled "This sliced ham looks like it's out of focus." On its own, the ham package is not that exciting, but there's something strange about this ham. And unlike when you said that while cleaning out your fridge, this shouldn't make you sick. Though, there's a chance this ham could induce motion sickness. It looks blurry. But give it a second look. Focus on the wood grain. The grid at the bottom of the tray. The slice edges at the bottom edge of the ham. This picture is totally in focus. It's early in the year, so it's nice that this image won't totally break your brain like that list of the best optical illusions of 2016 as voted on by scientists. Some of those can make you go cross-eyed forever.